Born at Wilkes-Barre, Pennsylvania, November 12, 1880, he graduated from the United States Naval Academy in 1903. He married Katherine Adele Rhodes, July 24, 1907. He was commissioned an Ensign, February 2, 1905, and advanced through the grades to Admiral, August 1, 1939. He served in various assignments at sea and ashore and in 1917, following U.S. entry into World War I, commanded the transfer of a torpedo flotilla from a station in the Philippines to the Mediterranean. He was an Aide to Admiral William S. Sums, 1917-19. After the war, he served on the USS South Dakota and the USS West Virginia and in 1924-25 commanded the USS Nitro. In 1925-28 he was Inspector in Charge of Ordnance at the Naval Proving Grounds, Dahlgreen, Virginia. From 1928 to 1930 he was on the staff of the Commander of Destroyer Squadrons, Battle Fleet, ultimately becoming Chief of Staff and from 1930 to 1933 was an Aide to the Secretary of the Navy. He again commanded the USS West Virginia in 1933-34 and, promoted to Rear Admiral in November 1934, was Chief of the Bureau of Ordnance from 1934 to 1937. In September 1937 he was given command of Cruiser Division 3, Battle Force, and in July 1938 moved up to command of all Cruiser Divisions, Battle Force, with the rank of Vice Admiral. 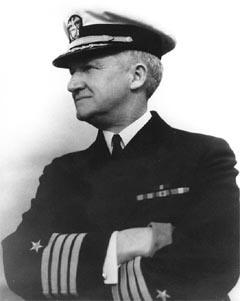 In August 1939 he became Chief of Naval Operations with the rank of Admiral, having been selected by President Franklin D. Roosevelt over more than 50 more senior officers. He held that post until March 1942 when, in the reorganization that followed the Pearl Harbor disaster, he was replaced by Admiral Ernest J. King. Given largely administrative duties as Commander of U.S. Forces in Europe, a post he retained until August 1945. He retired from the Navy in April 1946. He suffered severe criticism for his alleged failure to forward key intelligence information to Admiral Kimmell at Pearl Harbor before the Japanese attack on December 7, 1941, and was censured in a Naval investigation in 1945. That judgment was mitigated in later years. He died at Washington, D. C. on August 20, 1972 and was buried in Section 30 of Arlington National Cemetery. His wife, Katherine Adele Rhoads Stark (July 31, 1880 - July 9, 1970), is buried with him.